Devils club. You will either love it or hate it. 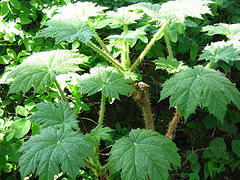 Devils Club (Oplopanax horridus) is an enigma. What else would a person think when it has horrid in its scientific name. We either love it or hate it. One thing is for certain, it as a tough survivor. To really kill it you will need to dig every piece of root out of the ground. Miss one piece, it comes back. Among the native population of the pacific north west Tlingit tribe, it plays a sacred role in their culture. They use it to treat an amazing list of ailments such as coughs and colds, stomach ulcers, tuberculosis as well as hypoglycemia. Members of the tribe steep it in tea, mash it up into a salve, chew it and even steam it. The Tlingit also use it to fens off evil. The plant is widely used and these days they call it Tlingit aspirin. However you will not find it in stores as yet. It hasn’t been approved by the FDA. Looking at the plant as you walk along the creeks and marshy areas you may notice how nice the plant looks in it’s habitat. It’s broad rich leaves look similar to maple leaves, but larger. Get up close and personal with the plant and you have a nasty piece of nature to deal with. It has leaves similar to palm fronds, dagger like spines cover the stalks and even the leaves are covered with razor sharp spines. The red fruit is a favorite of bears. It grows all over the north west and down through Oregon and will even be found as far east as Michigan and Ontario although it is rare there. Devils club loves to habitat the huge old trees of the west where it may run free as it pleases. The acidic soil is it’s gravy and it loves the sun and shade these forests offer. If you don’t have the inclination to collect the plant for medicinal purposes, devils club may not appear to be a favorite among your garden choices. But in the right setting, people have praised it’s use a bold foliage plant. The leaves wide veins run through deep channels like the glaciers scour the valleys. The tissue between the veins are puckered and heavily textured like the face of a bulldog. The spines go through the skin. Wear jeans and they will go through like a hot knife through butter. The thorns will cause festering. They break off under the skin and must be removed with tweezers for relief. Devils club will stand the cold down to 20 degrees. It prefers to have both shade and sun in medium doses. It also loves to be in moist conditions. The plant may grow to 5 to 8 feet tall. It’s size and reputation make it a mark for fencing. Western division parks have used it as a natural fence to keep people from entering ecologically sensitive areas. The plant is slow to grow. It takes two winters to just germinate. Scientists are attempting to get it’s to grow quicker as there is a great deal of interest in it’s ability to help in the treatment of tuberculosis and psoriasis.